One of the "truths" of modern life is that advertisers track everything you do on the Internet. But you can easily take back some control. You've seen this tracking. If might even have freaked you out a bit. You might have searched for a product at the Staples or Office Depot web site. Then you hop on Facebook . . . and instantly see advertisements for the product you were browsing. Yikes! How do they do that? Well . . . a number of advertisers have joined together to improve YOUR browsing experience and THEIR sales. When you visit a site, they put a "cookie" on your browser. Then when you go to the next site, it reads that cookie and accesses your browsing profile. To be honest, there are hundreds of millions of people browsing these sites at any given time. No one is trying to tie all this information together an get to know you personally. But they ARE trying collect a massive and growing amount of information about you as a unique web surfer. It might be a little scary if they actually connected up all that info and added your personal information. But no one other than the NSA is really doing that. So you need to be prudent, but don't get too worried. Here's how to be prudent. "Some of the ads you receive on Web pages are customized based on predictions about your interests generated from your visits to different Web sites. This type of ad customization is sometimes called 'online behavioral' or 'interest-based' advertising. Such online advertising helps support the free content, products and services you get online. The DAA Principles apply to interest-based advertising and other applicable uses of Web viewing data collected from a particular computer or device over time and across unaffiliated Web sites." When you click on the "Choice" icon, the browser will look at all the member advertisers who have cookies on your browser. 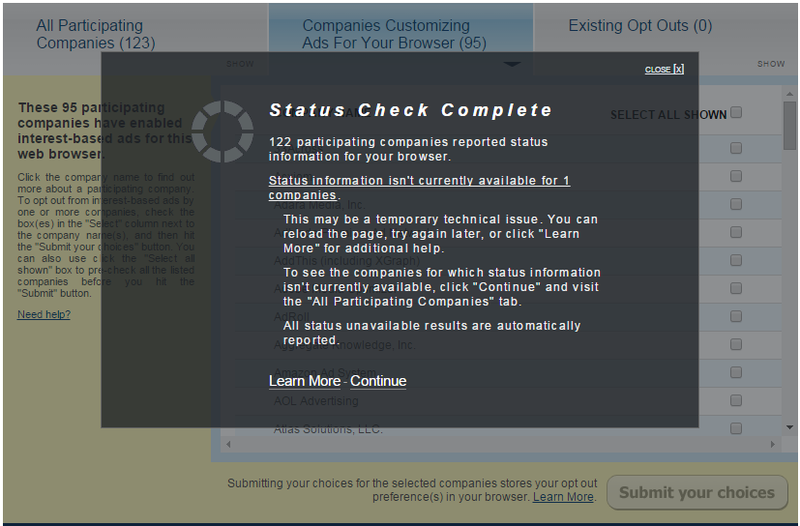 Then you can check boxes and opt out of their advertising. In addition, the site is a great educational source about advertising, privacy, and industry ethics. Take a look around! Yeah! Enjoy your freedom. But just be aware that this is browser specific. Here's what that means. In other words, it's nice to have the ability to opt out - but you might have a lot of work ahead of you.